Buy New Panasonic Lumix TZ55, 16mp, Selfie LCD 3.0", 20x Optical Zoom, WIFI/NFC (White) Free 8GB & Case Malaysia At FotoZZoom! 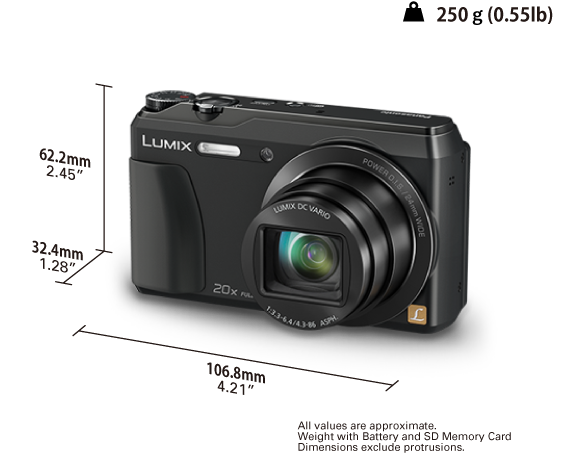 The TZ55 is a pocket-sized camera which features a 24mm ultra-wide angle lens and 20x optical zoom. It's the first camera in the Panasonic Lumix TZ series to incorporate a tiltable LCD screen, plus the compact has a 16.1-megapixel MOS sensor and Sonic Speed Auto Focus (AF). The Lumix TZ55’s wide connectivity options also mean that images and movies can easily and instantaneously be shared via smartphones or tablets. Remote shooting and instant geo-tagging is also possible. Other features include a Noise Reduction (NR) system, Optical Image Stabilisation technology and full HD video capabilities. An independent 'motion picture' button on the top of the camera allows users to instantly start shooting a video and with 10 Frames per Second (FPS) shooting in high speed burst mode, even the most fleeting scenes can be captured in images. For those wanting more creative control 15 filter effects, including Expressive, Retro and Old Days are available and a Creative Retouch function allows users to add effects to images already taken. Plus, a new Creative Panorama function features 13 filter effects which can be overlayed on panoramic shots. Standard Package Included Software * The DMC-TZ55 Operating Instructions for advanced features is available for downloaded at Panasonic LUMIX Customer Support Site using PC, smartphone or tablet connected to the Internet. Included Software * The software for PC is not bundled with DMC-TZ55. Please use the software pre-installed to the PC or other general image viewing software to browse pictures.